Häfele Engineering focusses exclusively on the requirements of the furniture industry – along the entire value creation chain. Häfele employees operate at the interface between development and production of innovative fitting technology and the creation and manufacture of exclusive furniture lines. With our international brand products, we succeed in providing top-class products and services. We produce our hardware and fittings at six locations and export our high quality standards throughout the world in the form of our products and services. The Häfele brand is a promise to industry. And the customer knows what he are getting: Quality from Häfele! Häfele is characterized by close cooperation with industry partners. The end user therefore receives requirement-oriented furniture innovations and added value in terms of quality, functionality and comfort. 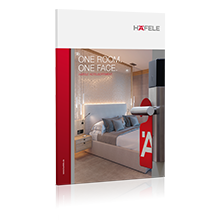 Häfele's industrial partners of are supported along the entire value creation chain and therefore acquire international competitive advantages for their furniture solutions. Let yourself be advised by Häfele and benefit from imagination and creativity from Nagold.